I was born in the town of Pottstown, Pennsylvania April 16, 1974. For most of my early training, I trained alongside my father, John Jorgensen. My father reached the rank of E Dan in the WTSDA, prior to curtailing his training for medical reasons. Today, I run Keystone Martial Arts along with my wife, Richelle (Rikki) who currently holds the rank of Sam Dan. I have worked for a number of years in the Software Development field, as a Quality Assurance Engineer, and sometimes as a Project Manager. I am currently teaching Tang Soo Do full time. I have a B. S. in Secondary Education from Penn State University. When, where and why you started Tang Soo Do? 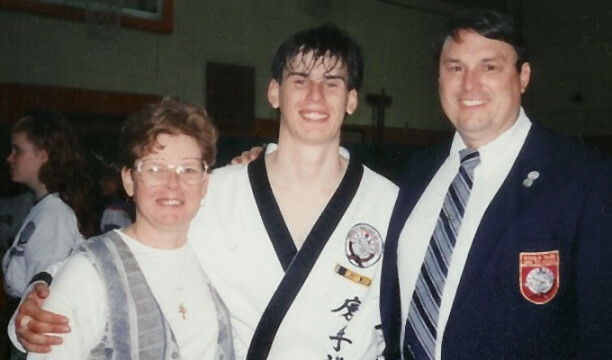 I had always been interested in the martial arts as a child, but up until that time I had quit everything I had started, including band, Cub Scouts, and soccer. My mother was not ready to spend the money for a karate class that she felt I was all too likely to quit. Then something happened that truly changed my life. Master Vaughn brought a small group to perform a martial arts demonstration at a gymnastics meet in which my sister was competing. My father taped that demonstration, and I remember watching it later and saying "I want to do that." It turned out that Master Vaughn was starting classes at the same place where my sister took gymnastics, so my mother decided that if the family was going to be there anyway, I could "give it a try." Twenty-three years later, that gymnastics studio no longer exists, but Vaughn's Dojang is still going strong, and I am still here, as a Master Instructor. I believe that Master Vaughn still has a copy of that tape, and I think my mother is still dumbfounded that I managed to stay with something so long. Master Jorgensen and his parents after his E Dan test. What were your first impressions when you started and how have they changed? I think my first impression was something along the lines of This is incredible! Honestly, that hasn't changed much. What has changed are my reasons and methods of training. As a child, I was uncoordinated, shy, and spent most of my time pursuing academic rather than physical accomplishments. I was the quintessential "nerd" or "geek". I was unmercifully bullied, and I wanted to learn how to beat up the bullies. Instead I learned over time how to stand up to them, through confidence in myself. It was amazing how quickly they moved on to other targets once I finally figured this out. 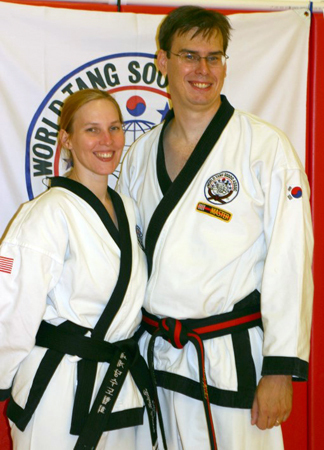 As I continued to grow, I learned more about how Tang Soo Do can help in all aspects of life. I had the unique experience of growing up with Tang Soo Do. Tang Soo Do is not something I do, it is who I am. Notable accomplishments in the martial arts field? I spent many years competing, and in the process won many medals and trophies including several grand champion trophies, and although I am proud of this, I consider these the least of my accomplishments. Greater to me has been achieving the rank of master, which was a lifelong dream, but even that I do not consider my greatest accomplishment. I believe my greatest accomplishments in martial arts have been in my opportunities to serve, teach, and help others. I have served on the WTSDA Board of Directors for the past two years as Chair of the Regulations Committee, and in so doing, I have been a part of the future direction of the WTSDA. I only hope that my contributions will increase in this area. I have had wonderful opportunities to teach at Gup Clinics, Regional Black Belt Clinics, and even at the USA Master's Clinic. My greatest accomplishment, though, is in seeing my student's succeed. Whether it is placing in a tournament competition, or attaining higher rank, the pride I feel in seeing students reach goals they never thought they could achieve cannot be surpassed by any other accomplishment. 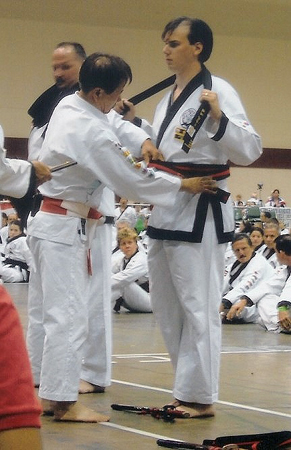 Master Jorgensen receiving his Master's belt from Grandmaster Shin (left) and with his wife Rikki (right). What was your master's thesis on? My Master's Thesis was on all aspects of testing, including the history, psychology, and execution of testing. I chose this topic because I felt that the general public, and often even martial artists themselves are all too concerned with belt rank, without really understanding what that rank means; what's involved in achieving that rank. I felt that testing to achieve rank was a necessary concept in the martial arts, and I wanted to explore why this was so. My thesis was entitled Deconstructing The Martial Arts Test: Finding Balance and Completeness; Fulfilling a Modern Need. Although that may be a long and extravagant title, it basically indicates what I learned. By deconstructing our testing methodologies, I discovered that the traditional martial arts test is one of the few balanced and complete methods of testing that we have in modern society. Martial Arts testing serves as a modern Rite of Passage, something that is missing from our modern world, but is desperately needed. I learned that when children enter adolescence, they need to be confronted with certain formalized trials that challenge them mentally, physically, and spiritually. These trials serve as Rites of Passage between childhood and adulthood, and indicate a readiness to enter society as a contributing member. When these Rites of Passage do not exist, adolescents invariably find a way of creating their own trials, and when they do, these are almost always negative, harmful, and dangerous. Our testing process fills this void, and in so doing assists our students, regardless of age, in becoming true adult contributing members of society. What is your favorite part of Tang Soo Do? My favorite part of Tang Soo Do is the endless learning opportunities it presents. I love to analyze our techniques and our hyung in particular to see what I can learn. Each time I peel back another layer, I find that there is more to learn. Learning not only what to do, but why we do it the way we do, is something that drives me forward to continue training and teaching. It never ceases to amaze me how many black belts complain that they are not learning anything new. I tell my black belts: "If you are not learning anything new, it's your fault." I really believe that. Tang Soo Do is a lifetime pursuit of learning, and only by learning new things can we hope to teach others with quality. Perhaps even more than discovering new things, I enjoy seeing the light of discovery in the eyes of a student when he or she finally grasps a new concept. By continually striving to make new discoveries myself, I hope to continue to see that light in my students' eyes for as long as I continue to teach. Master Chuck Vaughn, and Master Jorgensen. Who are some of your role models in and out of WTSDA? Outside of the WTSDA, my role models are my family members. My parents, who have always worked hard to support me in my dreams, and my in-laws, who welcomed me into their own family. My sister, who protected me as a child when I could not protect myself, and who is now a wonderful mother herself. All the extended family members I have not mentioned have helped shape who I am today. 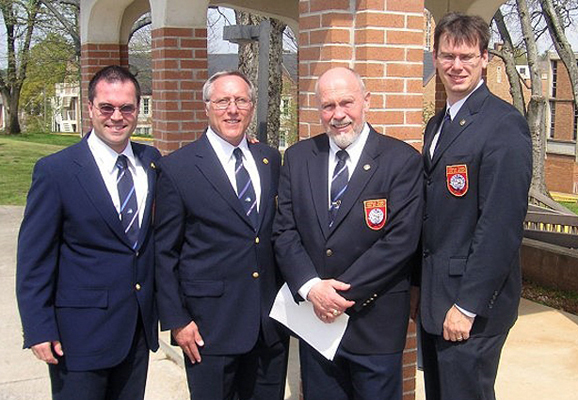 Having grown up in the WTSDA, most of my role models are WTSDA masters and members. First is Grandmaster Jae C. Shin, for creating such a wonderful organization and providing never-ending leadership over the years. Our organization is a true family, and without Kwan Chang Nim's example, we may never have grown to become what we are today. He truly is a great martial artist, a great teacher, a great leader, and a great man. Next is my instructor, Master Chuck Vaughn. He taught me so many things over the years about the path of the martial artist that I will never be able to repay him. Being a founding member and a part of the growth of Vaughn's Dojang will leave me with memories and experiences I will always treasure. Master Vaughn continues to be a source of inspiration and martial arts wisdom. Thank you for teaching me not to be just a black belt, but a teacher as well. From here, the list of other WTSDA masters and members who I look up to is too long to list but includes the remaining founding members of Vaughn's Dojang who are still active WTSDA members, all the masters of the WTSDA who taught me personally over the years asking for nothing in return as well as master who have inspired me in many other ways by the example they set. To my students: You have taught me as much perhaps as I have taught you. Without you, I would not wear the belt I wear today. Thank you for making Keystone Martial Arts a true dojang. Finally, last on my list but always first in my heart, is my wife, Rikki. You have been my partner in training and in teaching, and will always be my hero. You always do the right thing, no matter how hard it is, and for that you are a role model to us all. Why do you continue to train and serve in the WTSDA? To put it simply, I continue to train and serve in the WTSDA because I believe it is the best martial arts organization in the world. The WTSDA is a family in every sense of the word, and all the best people I have ever met have been WTSDA members. The WTSDA also remains highly traditional without being overly stringent. 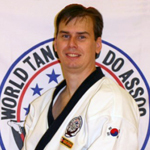 It allows its instructors to form their own identities, and by extension allows each and every dojang to have its own unique character and identity as well, while still remaining part of the larger organization. In the age of martial arts franchises, this is actually a relatively unique characteristic in martial arts organizations, and it allows for each instructor to create their own successes. What is your favorite Hyung and/or weapon and why? I really love all hyung. Each hyung or series of hyung have something to say to us and something to teach us. If I had to pick one hyung that stands out amongst the others, though, it would be Bassai. This hyung continues to present new challenges every time I do it. It is the first truly "long" hyung we learn, and it presents many new mental and physical challenges in the learning process. When I see a red belt, a Cho Dan Bo, Cho Dan, E Dan, Sam Dan, or master execute this hyung, I can see the subtle differences in each rank. This form is an outstanding teaching tool, and a wonderful learning instrument as well. To truly understand it, one must master the intricacies of balance, rhythm, focus, and power. Its applications in self defense are endless, and one can spend a lifetime discovering new applications for each movement. This is truly a hyung that I will spend the rest of my life learning and enjoying. My favorite weapon is the Jang Gum, or long sword. This is the traditional weapon of the master, but this is so for a reason. Every weapon has its own unique character, but I believe that no other weapon will teach a martial artist as much about focus and control as a sword, especially a live, sharpened sword. The metal and blade of a sword have a unique energy, and to control that energy for even a single cut takes extreme concentration, focus, and determination of spirit. Any mistakes of the martial artist holding the sword are magnified a hundredfold through the blade. Performing sword cuts correctly becomes a meditative experience. When used incorrectly, the sword will wobble, shake, and even cut its owner. When used correctly, though, the energy of the blade and the energy of the martial artist wielding the blade combine and become one. This is the true culmination of weapons training. 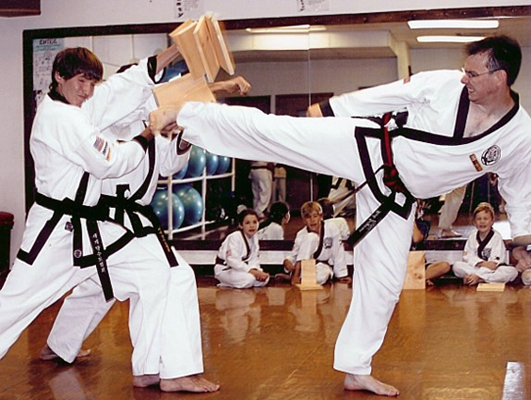 Master Jorgensen demonstrating a 4-board side kick break. Difference between when you first started training and today? I think the biggest difference overall is in the length and format of classes. We used to train for 2 or 2 ½ hours per class, with all ranks and ages in the same class. Today we usually have one hour classes, and split them between youth and adult, beginners and advanced. This allows us to reach more students and has forced us to refine and develop our teaching methodologies. At the same time, we lose some of the lessons that can come from a longer class, and our youth and beginner students may miss out on the experiences that come with training alongside adults and senior students. This is why I feel that special classes and clinics have become more popular, and are a necessary part of today's training. I encourage everyone to participate in these events, as they allow students to get a glimpse into what training in the past was like, and they provide invaluable experiences. In addition, teaching young children and women was something that was still relatively new when I first started. Little Dragons programs were completely unheard of. I am glad to see the trend of teaching children and women continue in a positive direction. Most of my students today are children, and I am happy to say that I have a virtually equal number of boys and girls training with us. Finally, I would say that the addition of new technology has changed the way we do things. When I started, there was no email, no internet, and in most homes, no computers. Today, knowledge of martial arts history and philosophy is immediately available to everyone. In many ways this is a wonderful thing, as we have a greater opportunity to share than ever before, and can reach greater numbers in the process. There is a danger, though, in that where we once relied solely on our instructors for guidance, many students now look beyond their instructors and begin to think they have a greater understanding of the martial arts than they really do. Always remember that your instructor should be your primary source of information, and that you must be careful to filter knowledge obtained from other sources. Youth: Don't ever let anyone tell you that you can't succeed at reaching your dreams. If you have a dream, hold on to it. You can accomplish anything, as long as you are willing to work for it. Remember that the only true way you fail is if you quit. Teen: Don't become too distracted by all the other activities and social opportunities you will have as a teenager. Remain focused on your training, and resist the urge to take "time off". I am not saying to avoid other pursuits, nor that you shouldn't have fun, but all too often, I have seen teenagers that neglect their training and regret it later in life. Decide where your priorities are and follow those priorities. Adult: Remember that you are not a child or a teenager, and that no one expects you to look like one. Do not look for excuses to limit your training. Instead, train smart. Remember that you are a role model and a teacher to our younger students, regardless of your rank, and that you must take that responsibility seriously. Always look for new and exciting ways to present the same "old" material to students in different ways. Make connections to your students through their own point of view and experiences, while sharing your point of view and experiences. Telling a story is often the best way to illustrate a point or concept. Adults need a break from the "old school" every once in awhile, and that it is okay to play martial arts games with your adult students. Remember also that youth students will benefit from the discipline you instill in your adults, and that it is okay to challenge them in this way. Bring all ranks and ages together every so often, as this will benefit all students. Plan your lessons ahead of time, but don't be afraid to "go off script" occasionally (key word - occasionally) in order to teach a lesson that the students really need. Talk to other instructors, visit their classes, and use their ideas to make your own classes better. Personal comments and your goals for future? Thank you for giving me this opportunity to share my history and views with other students and instructors of the WTSDA. I would encourage any student to talk to masters and instructors about their history and philosophy. For the future, I hope to grow my own dojang, and hope that one day my students will have the urge and drive to start their own studios and become masters themselves, spreading Tang Soo Do to new people in new places.